The market dashed 87 points on news that Al Gore would or would not run, the new Chinese taxes on exporting molybdenum and Chamique Holdsclaw’s retirement. 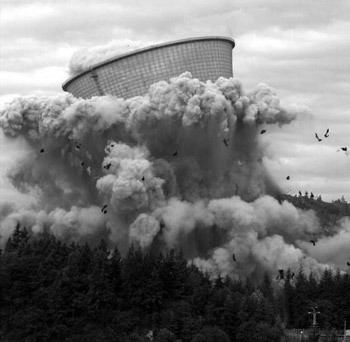 This picture of a nuclear reactor imploding probably didn’t help anything either. 1st Half of the Week: Boo bond yields. Hurray bear (market)! 2nd Half of the Week: Boo bears, Hurray Good Economy! Boeing (NYSE: BA): Continues to dominate Airbus in orders of “giant expensive flying things that will lose their owners tons of money and destroy the environment at a greater rate than anything other than cows”. Blockbuster (NYSE: BBI): High fixed cost structure + retarded management = decision to enter into a price war with Netflix (NASDAQ: NFLX). Limelight (NASDAQ: LLNW): IPOed in the limelight but subsequently has fallen out of the limelight. Our favorite stock both run by nerds and also in the same business as Akamai (NASDAQ: AKAM), but which is not Akamai. How has Satan’s Portfolio been performing? Any new additions there? I’m sure he’s been active considering all the recent global turmoil. It’s very crucial that we work through proper way with keeping updated with news; I believe we will be able to succeed only when we start focusing on these things better, as it’s not possible for anyone to be successful without it. Luckily, I am with broker like OctaFX where I get complete support which is through their daily market news and analysis service, it’s ever easier to follow yet is highly advance and updated, so due to that I am able to work well.